Chef Fabio Viviani is the owner and executive chef of three restaurants, and his new cookbook, “Fabio’s Italian Kitchen,” was just published. He stopped by “CBS This Morning: Saturday” to share his fried veal cutlets. After completing a rigorous training session with the men of Los Angeles Task Force 94, Chef Fabio heads to the firehouse kitchen to share the secrets of his tasty proscuitto-filled manicotti. This delicious baked pasta is an easy way to make dinner for the whole family and then some. With special guests Firehouse 94 Task Force, LAFD. If beef is what for dinner, let Fabio show you how to create the ultimate pepper steak. This elegant dish comes together in less than 30 minutes, and is sure to impress. With special guest JOELLE CARTER, from “Justified” on FX. Fabio Viviani prepares his mom’s meatballs, drunken spaghetti and tomato salad with orange and feta. These super-easy, fast-baking chocolate cookies come together in less than 15 minutes. It’s like chocolate heaven. Brinner? Fabio’s honeyed ham steak & fried eggs with green beans is a fantastic, easy egg recipe that’s good enough for dinner if you can’t get around to it at brunch. Plus, Fabio’s simple test to check the freshness of eggs in your refrigerator, and a sure-fire way to tell when your eggs are finished, so you don’t over-cook them. Hanging at SOBEWFF with Chef Fabio Viviani and we discuss his Bertolli Olive Oil cooking demo at Casa Tua in Miami, new restaurant Siena Tavern in Chicago, new cookbook “Fabio’s Italian Kitchen”, webshow “Ciao Chow!”, and his use of social media. 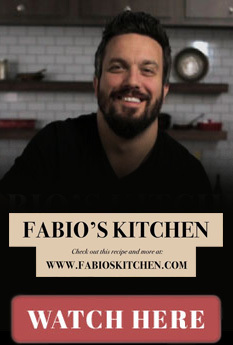 Chef Fabio Viviani talks about being the fan favorite in “Top Chef,” his Internet show “Chow Caio” on Yahoo, how to make Italian favorites gnocchi and fresh pasta in less than 5 minutes, and how setting his grandmother on fire got him started in cooking. Ellen TV – Veggie Burgers with Fabio Viviani! Celebrity chef Fabio Viviani got cooking with Ellen and whipped up these two delicious recipes! From his Chicago restaurant, Fabio takes on one of America’s all time favorite comfort foods, deep dish pizza. With tips and tricks on how to make the ultimate pizza pie.